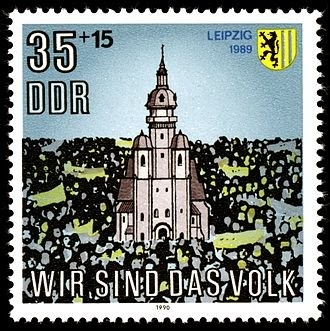 The Monday demonstrations (Montagdemonstrationen) in 1989 in Leipzig were the events paving the way to the German re-unification in October 1990. The most famous chant became Wir sind das Volk! ("We are the people! "), reminding the GDR leaders that a democratic republic has to be ruled by the people, not by an undemocratic party claiming to represent them. According to an article in the Munich-based Süddeutsche Zeitung, the German Patent- and Trademark Office DPMA has now deleted a trademark containing the words "Wir sind das Volk" which had been registered by a rightist splinter party for the reason of lack of distinctiveness. The request of cancellation had been filed by the city of Leipzig represented by its mayor Burkhard Jung. The decision is not available on the internet (at least as far as I know) such that we have to rely on the Süddeutsche Zeitung as to what concerns the more detailed reasons. Allegedly, the DPMA found that the lack of distinctiveness results from the inseparable connection with the jounger German history, the end of the GDR and the German reunification. According to Burkhard Jung: "It is now clear that this decisive phrase belongs to those who have carried it out into the world: the people" and that it is further clarified "that rightist splinter groups cannot protect this sentence to make money out of it". A look into the official register reveals that the trademark concerned must be No. 3020110368171. filed in July 2011. However, a further interesting result of the inspection of the register is that the former mayor of Leipzig Wolfgang Tiefensee had registered a trademark on "Wir sind das Volk" in 2002 together with Christian Führer, a priest of Nikolai Church in Leipzig "in order to avoid abuse" (see here). Apparently, avoiding abuse is not a proper use of the trademark such that the earlier trademark was deleted in 2011 on request by a third party (guess who?) due to non-use.